Spellbooks acts as your weapons to defeat your enemies by solving puzzles. You can improve and evolve your spellbooks. 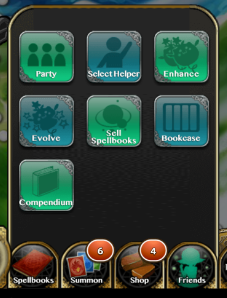 You can also obtain Spellbooks by leveling up. Each spellbooks has an attributes, skills, cost, types, levels, hp, atk and rec. Understanding the spellbooks are so important in the game because they give you an insight of what will be your strategies in solving the puzzles and defeating your enemies. These are the seven categories in Spellbook menu. You can only have 5 Spellbooks in a party. You can check individual spellbooks by tapping [HOLD]. 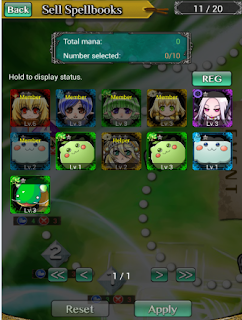 As you can see there is HP which is Health Points, ATK which is Attack and REC which is the Heart CARD in the puzzle and Heart card heals you in the battle. Each card has a max level and cost. Every party has a total cost limit. 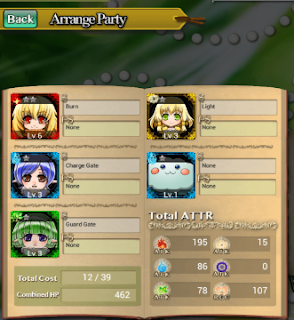 You can see their cost when tapping [HOLD] the spellbooks. Spellbooks have skills, there are skills that help you in the puzzle and there are skills that have effect on the enemies. Some spellbooks may have party skills which is more useful but every skill or party skill has a mana cost so decide carefully WHEN to use skills. You can check the Total ATTR of a party. This is to check your spellbooks in the party if you have lacking attributes, so that you can rearrange your party and make a balanced party of attributes. Creating a party that has lacking of specific attributes OR creating a party consist of many same attributes of spellbooks would be inefficient in killing enemies. Enemies have different attributes and for example when you face a boss that has an fire attributes and you don't have a water spellbook, It will be so difficult to defeat the boss. Though you only have 5 Spellbooks in the party, you can gain 1 additional spellbooks in puzzle by getting a Helper. 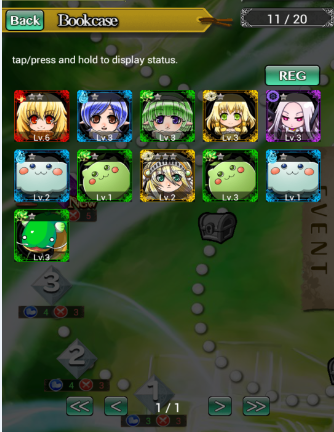 To get a helper just choose a random player from Siren Fantasia Database and it is usually in your range current level. To be able to use a specific helper just become friends with him after solving a puzzle. 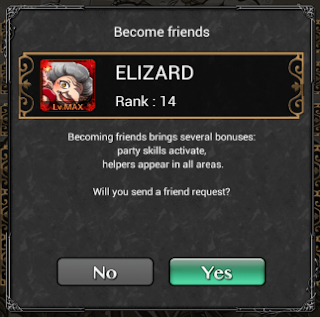 Becoming a friends will give you party skills activation and you can access the helper in any stage. Getting a strong helper really helps you on defeating an enemy or a boss. Just make sure that you should prioritize the helper's attributes. 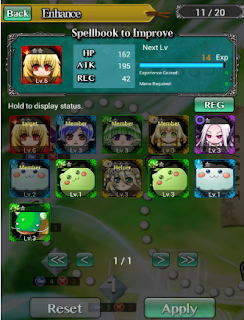 Even though the enemy is a fire for example and you do have a fire helper's 5 Star Spellbook, you're enemy is no match even it is a water spellbook attribute. You can improve you current spellbooks. To improve a spellbook you need to sacrifice one of your spellbooks. If the sacrifice spellbook and the selected spellbook has the same attributes, your selected spellbooks will get an additional bonus of 50%. The enhanced spellbook will improve it's level, HP, ATK and REC. You cannot sacrifice you're party member unless you will remove him in your current party. Do not over enhance your spellbooks because you need to save your total cost. you should create a balance party of equally balanced of attributes and enhancements. Insufficient, means you can evolve the spellbooks unless you meet the required level. 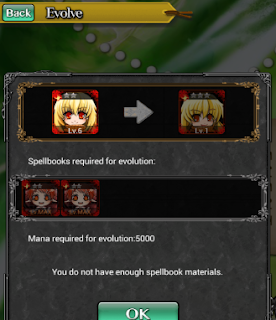 Not possible, means the spellbooks doesn't have evolution. You can sell spellbooks that are not currently in a party. You can gain mana after selling your spellbooks. Mana are required to evolve spellbooks. Bookcase is your storage of all your spellbooks. There is a limit in bookcase so you can't keep all your spellbooks you obtain from level, summons etc. To avoid filling up your bookcase is either you enhance a spellbook, evolve spellbook, sell spellbook or buy "expand bookcase" in store. 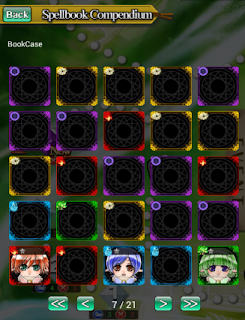 It contains information of all spellbooks in Siren Fantasia. Though it has the information of all spellbooks, but you need to obtain first to before you can get the information of the spellbooks. Compendium has 21 pages and each pages consist of 25 spellbook therefore it has 525 spellbooks in the game.